PandaTip: This guaranty agreement template is customizable to fit your individual needs. This section of the template captures both parties’ names as well as the agreement date. [Customer.Name] (Borrower) has requested to conduct business with as well as obtain credit from [Provider.Company] (Creditor). However, Creditor is unwilling and unable to offer credit unless borrower receives a guaranty of the requested credit being applied for. In consideration of this fact, [Guarantor.Name] hereby assumes responsibility for repaying [Customer.Name]’s debt to [Provider.Company] in the event that [Customer.Name] fails to repay this debt. PandaTip: Use the pricing table in the template to clearly define any principal amounts, interest, or fees which the guarantor will potentially be held responsible for in the event of a default. The table below outlines the principle, interest, and fees associated with the aforementioned requested credit line, which shall be fully guaranteed by [Guarantor.Name]. [Customer.Name] and [Guarantor.Name] are in agreement that with or without prior notice the undersigned may reimburse the above creditor in the example that the agreed payment is not made by borrower for all fees and credits remaining on said account. PandaTip: This section covers all terms and conditions of the guaranty agreement template. All information regarding payment and terms for this guaranty agreement are listed in this portion of the template. This guaranty is a continuing guaranty and shall remain in full force and effect irrespective of any interruptions in the business relations unless the termination is provided in writing and delivered to all participating parties. All monies available to Creditor for application in payment or reduction of the Liabilities of the Borrower may be applied by Creditor in such manner and in such amounts and at such time or times as it may see fit to the payment or reduction of such of the Liabilities of the Borrower as Creditor may elect, and the obligations pursuant to this guaranty agreement shall not be affected by any surrender or release by the Borrower of any other security held by it for any claim hereby guaranteed. Any demand for payment under this guaranty agreement. This is a guaranty of payment and not of collection the above mentioned undersigned waives any rights to such. No delay on the part of Creditor in exercising any rights hereunder or failure to exercise the same shall operate as a waiver of such rights. No changes or alterations will be accepted into this agreement unless delivered in writing and approved by all parties. This guaranty agreement is and will remain as long as effective bound under the laws of the state of [Company.State] furthermore all laws in said state shall remain respectfully in force for said state. 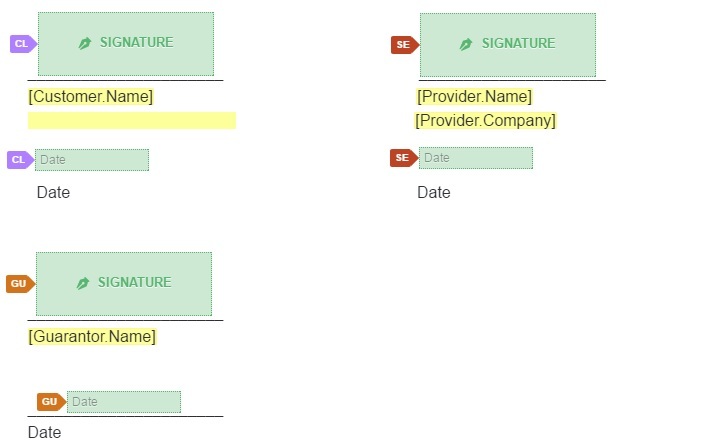 PandaTip: This section of the guaranty agreement template allows both parties to esign and date the agreement without the need to print the document. By signing below, all involved parties indicate their understanding and approval of the terms of this guaranty agreement as of the dates listed below their respective signatures.